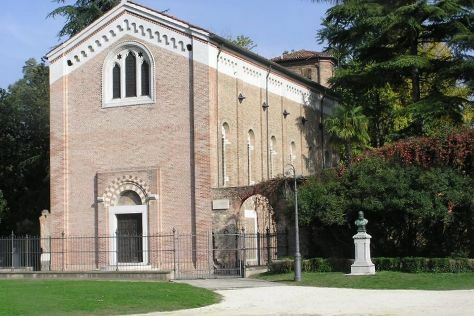 Start off your visit on the 26th (Thu): take a stroll through Cannaregio, make a trip to Basilica Santa Maria Gloriosa dei Frari, contemplate the long history of Ponte dei Sospiri, then contemplate in the serene atmosphere at Scrovegni Chapel, and finally pause for some serene contemplation at Basilica di Sant’Antonio. Here are some ideas for day two: take in the spiritual surroundings of Scuola Grande di San Rocco, then pause for some serene contemplation at San Giorgio Maggiore, then pause for some serene contemplation at Basilica di Santa Maria della Salute, and finally take a stroll through Dorsoduro. To see reviews, ratings, where to stay, and other tourist information, go to the Venice travel planner. Mexico City, Mexico to Venice is an approximately 17-hour flight. You can also do a combination of flight and train; or do a combination of flight and shuttle. Traveling from Mexico City to Venice, you'll lose 7 hours due to the time zone difference. In September, daily temperatures in Venice can reach 29°C, while at night they dip to 17°C. Finish up your sightseeing early on the 27th (Fri) so you can travel to Portoferraio. Portoferraio is a town and comune in the province of Livorno, on the edge of the eponymous harbour of the island of Elba. Kick off your visit on the 28th (Sat): tour the pleasant surroundings at Spiaggia di Cavoli and then stroll through Spiaggia Luisi d'Angelo. On the 29th (Sun), you'll have a packed day of sightseeing: kick back and relax at Spiaggia di Capo Bianco and then enjoy the sand and surf at Spiaggia Di Sansone. Plan my day in Portoferraio using traveler tips and tourist information provided by Inspirock. Do a combination of car and ferry from Venice to Portoferraio in 5.5 hours. Alternatively, you can do a combination of train and ferry. In September, plan for daily highs up to 28°C, and evening lows to 19°C. 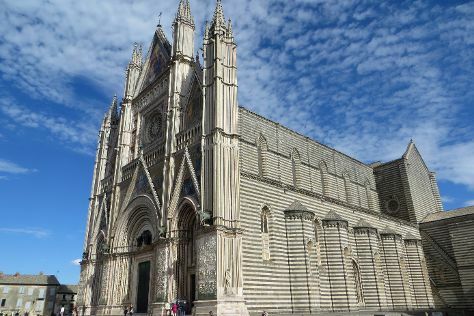 Finish your sightseeing early on the 29th (Sun) so you can travel to Orvieto. On the 30th (Mon), wander the streets of Borgo Roccalvecce, then take a stroll through Civita di Bagnoregio, then take in the architecture and atmosphere at Abbey of Saints Severus and Martyrius, and finally contemplate the long history of Duomo di Orvieto. Keep things going the next day: appreciate the extensive heritage of Centro Storico Orvieto, then pause for some serene contemplation at Chiesa San Giovenale, then steep yourself in history at Pozzo di San Patrizio, and finally contemplate in the serene atmosphere at Chiesa dei SS. Apostoli Pietro e Paolo. For ratings, other places to visit, traveler tips, and tourist information, read our Orvieto tour website . You can do a combination of ferry and car from Portoferraio to Orvieto in 4 hours. Alternatively, you can do a combination of ferry and train. Expect a daytime high around 30°C in September, and nighttime lows around 17°C. Wrap up your sightseeing on the 1st (Tue) early enough to drive to Assisi. 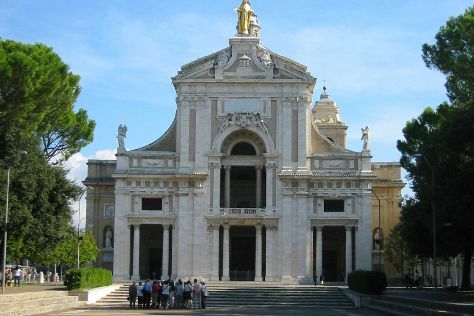 Kick off your visit on the 2nd (Wed): take in the spiritual surroundings of San Damiano, appreciate the extensive heritage of Centro Storico, then take in the spiritual surroundings of Basilica di Santa Maria degli Angeli - Porziuncola, and finally contemplate in the serene atmosphere at Basilica di Santa Chiara. Get ready for a full day of sightseeing on the next day: explore the historical opulence of Rocca Paolina, get to know the fascinating history of Centro Storico, then take in the architecture and atmosphere at Cattedrale di Santa Maria Assunta Spoleto, then steep yourself in history at Eremo delle Carceri, and finally contemplate in the serene atmosphere at Santa Maria delle Rose. To see where to stay, photos, maps, and tourist information, use the Assisi trip itinerary planner . Getting from Orvieto to Assisi by car takes about 1.5 hours. Other options: take a train; or take a bus. In October, daily temperatures in Assisi can reach 24°C, while at night they dip to 12°C. Finish your sightseeing early on the 3rd (Thu) to allow enough time to travel to Taormina. With its warm island weather and cliffside location overlooking the Ionion Sea, Taormina has been one of Sicily's most popular getaway destinations since the early 19th century. Kick off your visit on the 4th (Fri): don't miss a visit to Piazza IX Aprile, don't miss a visit to Corso Umberto, then stroll through Villa Comunale, then enjoy the sand and surf at Lido La Dolce Vita, and finally take in the pleasant sights at Chiesa Madonna della Rocca. To see traveler tips, maps, where to stay, and tourist information, go to the Taormina trip itinerary planning tool . Do a combination of flight and train from Assisi to Taormina in 5.5 hours. Alternatively, you can do a combination of train and flight; or do a combination of car and ferry. Traveling from Assisi in October, expect Taormina to be a bit warmer, temps between 28°C and 20°C. Cap off your sightseeing on the 4th (Fri) early enough to go by car to Cefalu. Cefalù is a city and comune in the Province of Palermo, located on the northern coast of Sicily, Italy on the Tyrrhenian Sea about 70km east of the provincial capital and 185km west of Messina. Start off your visit on the 5th (Sat): delve into the distant past at Mura Megalitiche, explore the ancient world of La Rocca, steep yourself in history at Duomo di Cefalu, then pause for some serene contemplation at Oratorio del Santissimo Sacramento, then don't miss a visit to Piazza del Duomo, and finally wander the streets of Cefalu Coast. To find where to stay, traveler tips, and tourist information, refer to the Cefalu trip itinerary maker site . Traveling by car from Taormina to Cefalu takes 3 hours. Alternatively, you can take a train; or take a bus. Finish up your sightseeing early on the 5th (Sat) so you can travel back home.